FIREWORKS MAGAZINE #78 on sale now! Complementing our usual features, we welcome two new articles this issue, the first of which will be a long-running serial. Dave Reynolds is a name that will be known to many of you, first coming to prominence in KERRANG! back in the 80s when it was every rocker's bible. Dave now takes a look at his favourite 10 year span across the history of Rock music, looking at the highlights as well as those releases that flew under the radar. Skip to page 14 to delve back into 1973! 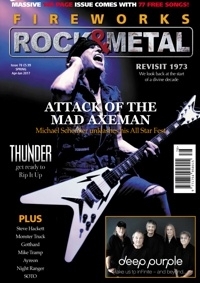 Andrew McNeice has been the flag-bearer for AOR and Melodic Rock for the past 20 years, running his www.melodicrock.com website with intense passion and a clear love for the genre. We asked him to discuss what he considered the ten most under-appreciated AOR classics of all time, and the results can be found on page 122. With our usual features, Dave Reynolds talks to 707 and Face Dancer in 'Bands That Time Forgot', while in Rob Evans' 'Sister Of Rock Column' he looks at Leigh Matty, Sue Willits, Jackie Bodimead and Amanda Blue. Caesar Barton's 'Expert Guide' delves into Supergroups and Collaborations this issue, while Steven Reid's 'Unsung Heroes' looks at the career of Bob Young. Of course, there are over 70 free songs included this issue for a completely unmissable, crazy price of only £5.99 (download version only £3.50!). Interviews, reviews and 70+ FREE songs: LET'S ROCK!